Amid uncertainty regarding the İstanbul local election results, the ruling Justice and Development Party (AKP) and the main opposition Republican People's Party continued exchange statements over the weekend. According to the unofficial results, Ekrem İmamoğlu, the candidate of the informal Nation Alliance led by the CHP, edged his rival Binali Yıldırım, the candidate of the AKP-led People's Alliance, by around 14 thousand votes. The process of appeals and recounts have been going on since the March 31 polls. 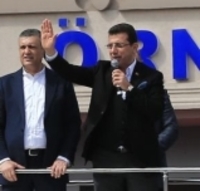 CHP Deputy Group Chairs Özgür Özel and Engin Altay announced on Saturday that they expect to be given the certificate of the election by Monday. The winning candidate İmamoğlu also made at the ceremony of handover for the Beylikdüzü District Municipality, which he was the previous mayor of. Not being a stranger to speaking every day since the elections, İmamoğlu also addressed people yesterday (April 14) in the Esenyurt district.